Is That A Mars Habitat? A Submarine? A Spaceship? Nope: It’s Home. [Jan Körbes], an architect living with his daughter in Berlin, specializes in recycling materials. 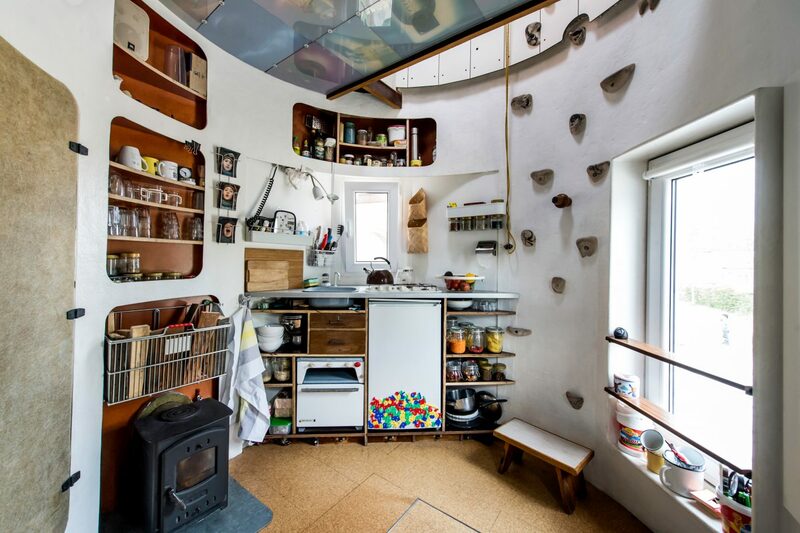 Inspired by discarded grain silos he saw across the Netherlands, he converted one into a micro-home that you would almost expect to see on the surface of mars. The guided tour in the video below give a pretty good feel for the space station feel of the abode. A lot of the silo house’s design was inspired by [Körbes’] childhood of growing up on boats. It’s exceptionally functional and nearly every nook and cranny of the home can be altered, repurposed, and changed back. For instance: the two pantries on the main floor used to the toilet and shower, but since the silo home is currently set up at ZK/U — Center for Arts and Urbanistics in Berlin — they make use of the facilities there instead. True to his specialization of creative recycling , a lot of the materials for the house were either donated, or bought at a steep discount due to various reasons. For instance, the windows were a small, unpopular size for most houses but work well here. This led to an evolving design of the house as it was being built, but everything [Körbes] and his daughter need is present inside of fourteen square metres on three floors. Under the floor on the main level is a bathtub with infrared heating — the cover doubling as the dining table with feet dangling into the tub underneath. The kitchen has a small oven, an old camp stove, and fridge — enough for two people — and the sink uses a foot-activated button so the [Körbes’] use only as much water as they need. A nearby small wood stove with an extendable wood storage basket heats the space. The house’s electrical (including a solar battery) and water systems are tucked into the basement beside the books, keeping the heavier objects low in such a tall and narrow dwelling. Larger rainwater collection tanks (a hack we’re quite fond of) surrounding the silo house also add ballast in case of storm. With a two metre ceiling height on the main floor and nearly as much in the bunking quarters upstairs — accessed by a climbing wall, [Körbes] says the space feels much larger than you would expect. Large enough, at least, to host a standing record of a 38-person party. It’s fun to see the ingenuity that goes into tiny living space design. If you missed it, check out these CNC plywood designs for building homes. [David Johnson-Davies] created a minimal Secret Maze Game using a single ATTiny85 and a few common components. This simple game uses four buttons, four LEDs, and a small speaker. The player moves in the four cardinal directions using buttons, and the LEDs show walls and corridors. If an LED is lit, it means the path in that direction is blocked by a wall, and attempting to move in that direction will make a beep. When the player reaches the exit, a short victory tune chirps from the speaker. Sample maze. A 16×16 matrix is allocated for maze designs. Since the ATTiny85 has only five I/O lines, [David] had to get a bit clever to read four buttons, display output on four LEDs, and drive a little speaker. The solution was to dedicate one pin to the speaker and the other four to charlieplexing, which is a method of driving more LEDs than you have pins. It takes advantage of the fact that most microcontroller pins can easily switch state between output high, output low, or low-impedance high-impedance input. As for the buttons, [David] charlieplexed them as well. Instead of putting an LED in a charlieplexed “cell”, the cell contains a diode and an SPST switch in series with the diode. To read the state of the switch, one I/O line is first driven low and the other I/O line is made an input with a pullup. A closed switch reads low on the input, and an open switch reads high. With charlieplexing, four pins is sufficient for up to twelve LEDs (or buttons) in any combination, which is more than enough for the Secret Maze. Charlieplexing is also what’s behind this 110 LED micro-marquee display, or this elegant 7-segment display concept that takes advantage of modern PCB manufacturing options. Where are you right now? You’re probably sitting at a desk staring at a computer screen. Us tinkerers/makers/hackers/diyers use computers all the time… they are a great tool and an easy way to spread and gather information. Since we spend so much time sitting at a computer, why shouldn’t the computer’s desk be made to enhance the experience? Self-proclaimed web guru [Ellis] admits to being a minimalist and wanted a super sleek computer desk. He couldn’t find a commercially available model that he liked so he built his own. The desk started as an Ikea floating shelf. The shelf comes with a metal bracket that secures to a wall, then the shelf completely slides over the bracket so that the shelf looks as if it is floating in air. Once the u-shaped bracket was installed to the wall, a custom compartment was made to fit in between the bracket’s arms. This compartment will hold a power strip, mini Dell computer and other accessories. On the outside of each bracket arm, [Ellis] mounted drawer slides. The stock shelf was then modified to mount to the newly added drawer slides allowing it to be pulled forward for typing or to expose the hidden compartment. When closed, the shelf-desk looks clean and blends into the wall color. A wide screen monitor is mounted directly on the wall just above the desk and a wireless keyboard/mouse combo supports the clean look. [Ellis] now has the minimalist computer desk he’s always wanted that doesn’t distract him from his work (or ‘net browsing). If you want to program an AVR chip as inexpensively as possible, then [Ian’s] solution might just be for you. He built an AVR programmer using only four components. This design is based on the vusbtiny AVR programmer design, with a few components left out. 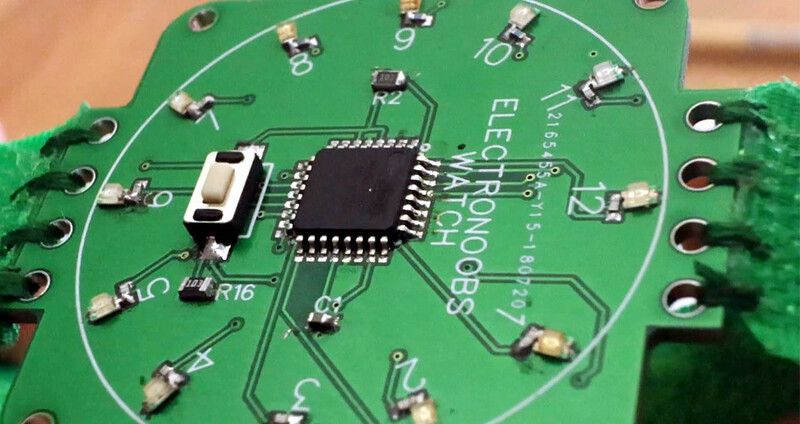 [Ian’s] design leaves out two of the resistors and two diodes, leaving just four components. These include a 1.5k resistor, a small capacitor, a USB connector, a six pin header, and an ATtiny45. He admits that this may not be exactly up to USB spec, but it does work. This is one of those projects that is really an exercise in “will it work?” more than anything else. The fact that you need to first program an AVR chip means that this wouldn’t be useful in a pinch, because you would already have to have a working programmer. Nonetheless, it’s always fun to see what can be done with as little as possible.